PertWeek: Revisiting THE AMBASSADORS OF DEATH | Warped Factor - Words in the Key of Geek. 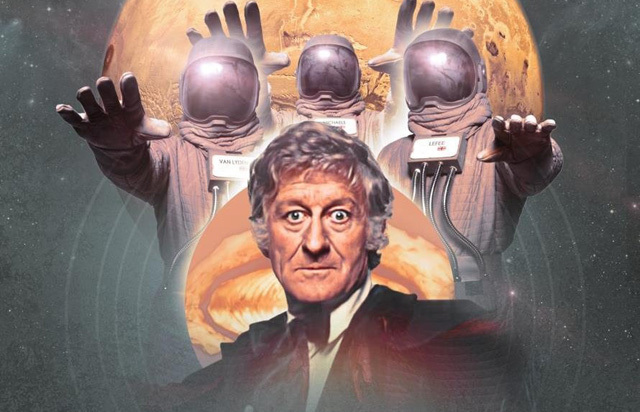 To kick off our annual PertWeek celebrations, in honour of the late, great Jon Pertwee, Matthew Kresal revisits The Ambassadors of Death. Doctor Who’s 1970 season is perhaps better remembered for stories such as The Silurians with its moral ambiguity and Inferno’s journey into a parallel universe. Yet between those two adventures is a forgotten little gem dealing with astronauts, manipulation and the threat of interstellar war. A story called The Ambassadors of Death. 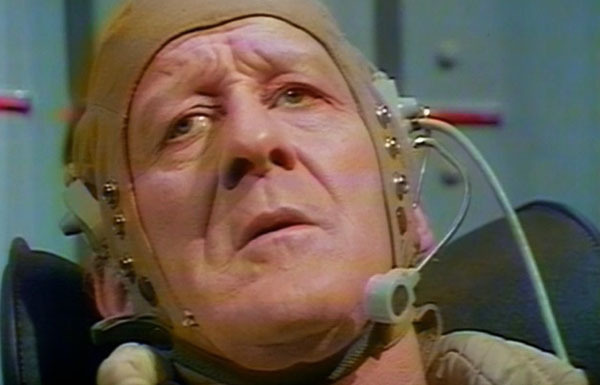 The Ambassadors of Death can be seen an alien invasion take on The Silurians. Both stories have similar beginnings with UNIT helping out a UK scientific establishment which brings the Doctor and Liz into a crisis. Both stories have scientists in the establishment being involved with the aliens at the heart of the crisis, the aliens in turn are not what they seem, and the Doctor finds himself caught in the middle while trying to prevent an all-out war. What separates this story from its immediate predecessor is its action packed nature. While The Silurians very much limited itself to the scientific center, the caves and immediate area around it for the most part, there is no such constraint on this story. Locations change frequently throughout all seven episodes, helping to give The Ambassadors of Death enough scope to make it not only stretch across them but never be boring. It also features a large number of action sequences. These include battles between UNIT personnel and the forces of the story's antagonist (in episodes one, two and seven respectively), a car chase in episode three, numerous attacks by the aliens and even the Doctor being launched into space (the one time the Doctor left Earth this season). The result is the most action packed story of season seven. The second lies in the motives of the story's antagonist. While The Silurians was centered around egos and power plays by various characters which caused the situation to get worse, this story centers around one man and his perceived threat of an alien invasion. General Carrington (played by John Abineri) manipulates everyone around him, ranging from the Minister of Technology, members of the British space program and indeed the space-suited ambassadors themselves by having them commit attacks to encourage the perception of an impending invasion. Carrington's motive isn't one of ego but one born of his sense of “moral duty”. All that leads to a rather surprising ending. After Carrington's plan is foiled and he is arrested, he walks over to the Doctor and tells him “I had to do what I did. It was my moral duty. You do understand don't you?” The Doctor answers back simply “Yes General. I do understand.” This is especially surprising if you consider that Carrington's plan isn’t too far removed from the Brigadier sealing up the caves at the end of the previous story. 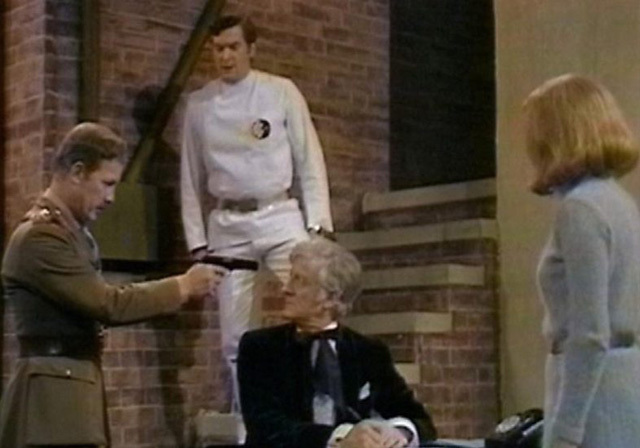 In fact, The Ambassadors of Death finds the Brigadier on the Doctor's side as Carrington's intentions become more and more evident as the story progresses. Perhaps the ending suggests that both the Doctor and the Brigadier have learned that sometimes their ways aren't the best for a particular situation, as illustrated by the fact that Carrington was simply doing what he thought was right as he claims. While less remembered than the stories it’s sandwiched between, The Ambassadors of Death holds up today. It’s well paced across seven episodes, features plenty of action sequences, yet also looks at the dangers of a misplaced sense of duty in an ever changing world. This story then, rather than The Silurians or Inferno, perhaps serves better as the template for the era that was to follow: action/adventure but dealing with bigger issues as well. Rarely would it be done better.